Located on the top of Mount Washington not far from the Monongahela incline, Bloom represents the bright future and revival of its community. 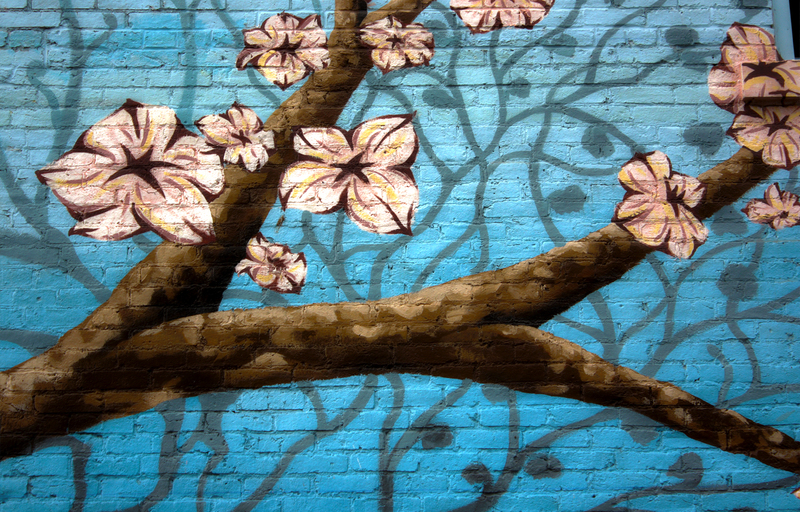 In creating the mural Bloom, the research led to an array of possibilities that opened up new ideas for a public art piece. Mount Washington is known for it’s industrial past. Steel workers would use its famous inclines to get to and from work. When a Pittsburgh native thinks of Mount Washington, the images of incline cars escalating the steep slopes of its hillside become synonymous with it. I started to think about how I would be able to incorporate the infamous industrial cars without directly depicting the cars themselves. Before starting work on a preliminary design to be presented to the community board, I met with several members of the Duquesne Incline and found very valuable resources to be used and recycled. After a tour of the lower inner workings of the incline and seeing its gigantic gears and large interworking parts, I asked if there were any spare parts from maintenance over the years that could possibly be used in the creation of my design. The Duquesne Incline was generous enough to donate 80 feet of incline cable (the cable which pulls the cars up and down the slope of Mt. Washington) and six incline wheels. The goal of my design was to engage visitors and pedestrians by making the piece interactive. In collaboration with engineers, the incline wheels would be anchored to the wall and the cable would then be wrapped around the wheels to create a pulley system mounted to the side of the wall. At the bottom right corner of the wall would be a crank for people to turn as they watched an entire pulley system work. 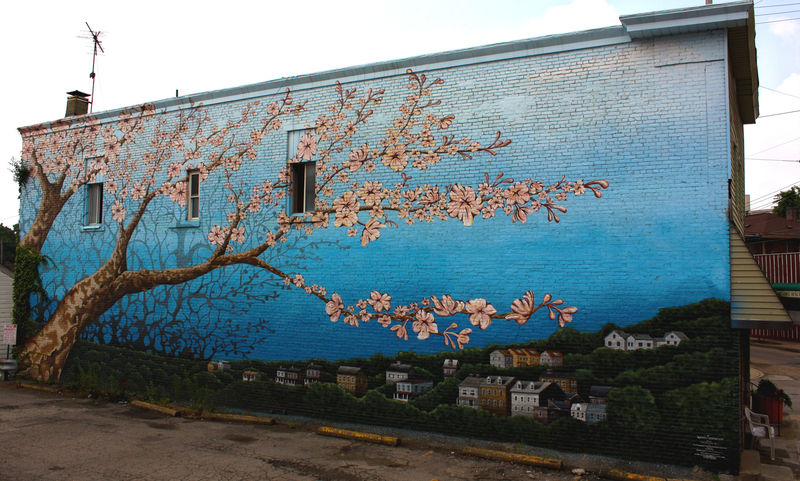 The goal was to make new art out of elements that were so important to the community’s past. The community loved the idea of taking something that they were known for and creating something new, but reconsidered the use of using any imagery of the inclines at all because the future vision of Mount Washington and the development of its green spaces were most important to them. Though my original concept was never developed, I enjoyed the early collaboration with the engineers and engaging the Mount Washington community. At this point in the design process, The Mount Washington Community Development Corporation (MWCDC) allowed me to see future development plans for the neighborhood. These plans included urban paths, green gardens, and replanting initiatives. 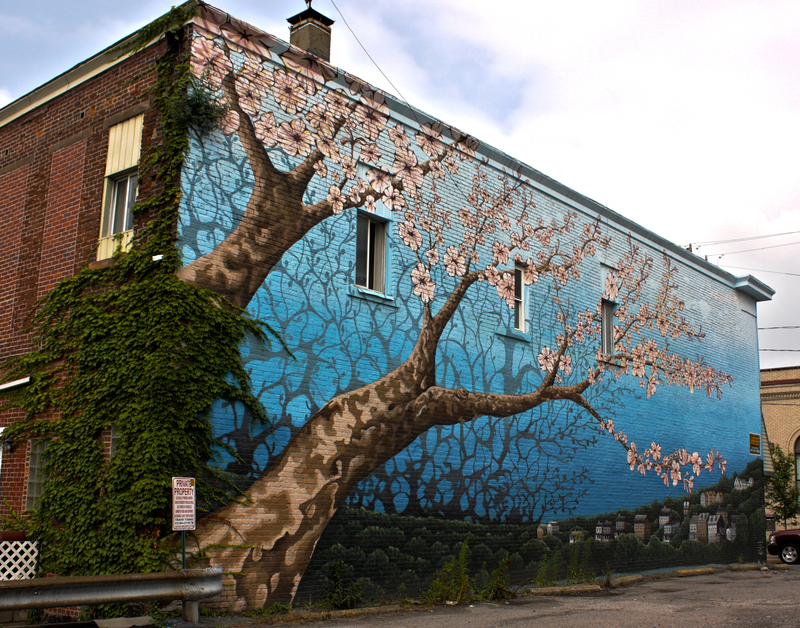 One of their initiatives was to bring back the cherry blossom tree, which was once indigenous to the hillside of Mount Washington. I began working with this symbol to represent both the past and a rebirth of the community’s identity. I decided that it was important to use the living green elements that grew on the wall to be part of the design. Instead of removing the ivy from the left side of the wall, I incorporated it into the final design. 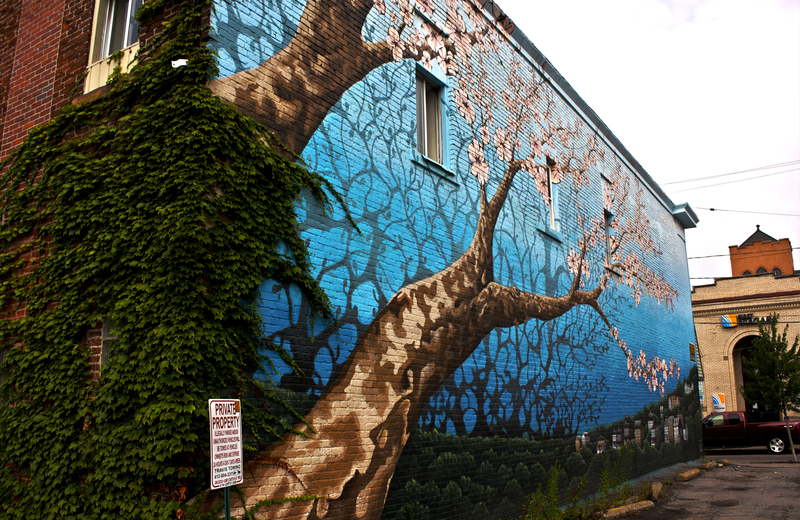 The ivy continues to grow and overlap the tree, echoing the importance of green space in the community. 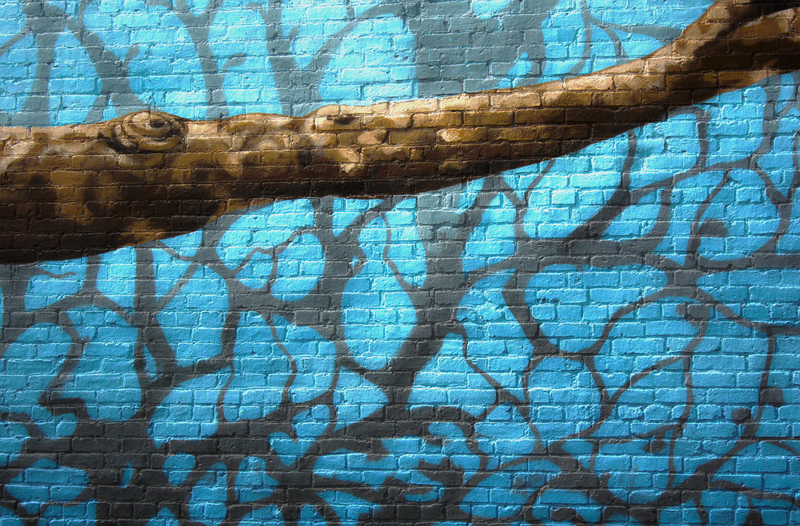 The organic elements add depth to the mural. 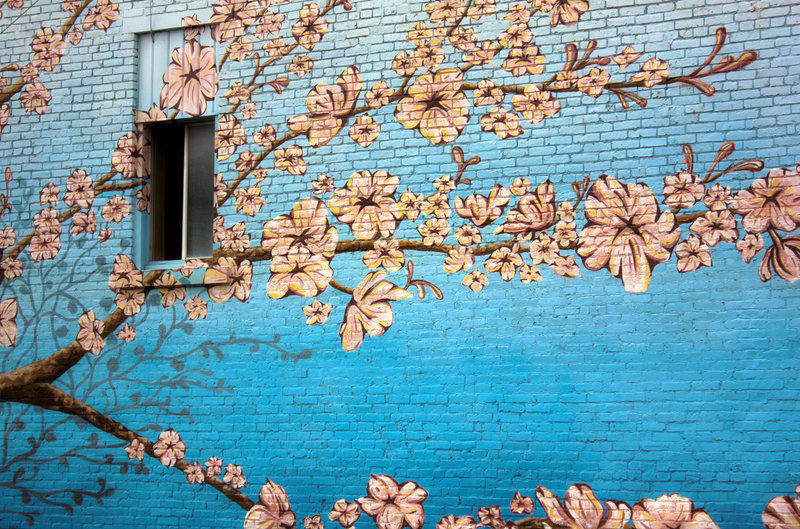 It becomes a living mural that will grow with the community.